At first glance, the heading of this devotion doesn’t seem to be good news. If you’re working in an organization, I expect you wouldn’t mind getting a promotion. But a promotion to the role of servant? That seems more like a demotion, doesn’t it? Yet, in light of Revelation 22, I would suggest that becoming a servant could actually be a fine thing. We are encouraged to see our worship, whether in the new earth or in the earth in which we live today, as offering to God all that we are, all that we do. We worship God in our prayers and praises, in our labor and love, in our work and witness. To begin, consider that in the future you and I will get to be servants of God. We will be serving the King of kings and Lord of lords. No matter the nature of our servant hood, the One we are serving will give it special honor. In the Old Testament, though all of God’s people were called to serve the Lord through lives of obedience, the priests in the temple in Jerusalem were the ultimate servants of God. They alone were able to offer sacrifices on the altar. In the New Jerusalem, there will be no temple, and all of God’s people will serve in a kind of priestly role, not by offering literal sacrifices to God, but by serving him with all they do and say and sing and pray. Many English translations render the last part of Revelation 22:3 with “his servants will worship him” (ESV, NRSV, NLT, CEB). This is a reasonable translation of the Greek verb latreuo. But the danger of this rendering lies in our tendency to limit worship to the kinds of activities we do in church services. Given what we have seen elsewhere in Revelation, there is no doubt that our future with God will include shouting praises to God and similar actions. Yet, we must remember that our service to God includes far more than this. We are to serve God, indeed, to worship God in all we do, both now and in the future. Consider a related passage in the New Testament. In Romans 12:1-2, we are to offer our bodies to God “as a living sacrifice, holy and pleasing to God.” This is our “true and proper worship.” The Greek word translated here as worship is latreia, a noun based on the same root as latreuo in Revelation 22:3. The language of worship in Romans 12:1-2 and Revelation 22:3 helps us understand that our worship, whether in the new earth or in the earth in which we live today, is offering to God all that we are, all that we do. We worship God in our prayers and praises, in our labor and love, in our work and witness. When you think of serving God, what comes to mind? What actions? What people? In what ways are you serving God in your life? If you were to think of serving or worshiping God as offering your whole life to God, how might this affect the way you work? Gracious God, it is indeed an honor to be your servant. It will be amazing to serve you in the New Jerusalem, when we can actually see you and know you in a more direct and intimate way. Yet, we are blessed to be invited to serve you today, to offer to you our bodies as a living sacrifice. O Lord, may I offer all that I am and all that I do to you today. May I give you my work as a part of my worship, and may you be honored in every bit of it. Amen. 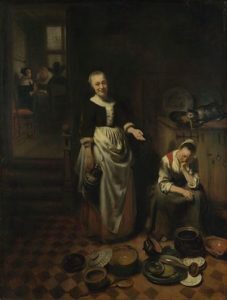 Image Credit: Nicolaes Maes – http://www.nationalgallery.org.uk/paintings/nicolaes-maes-the-idle-servant, Public Domain, https://commons.wikimedia.org/w/index.php?curid=614386.